Coach Dave Kelly comes to the Tigers in 2018 with over 20 years of coaching experience. He brings a wealth of leadership and knowledge to the Tigers defence. For 16 years, Dave was the head coach at Halifax West High School, and also spent 10 years as a defensive coordinator. With the Halifax West Warriors he won two championships as head coach and defensive coordinator. 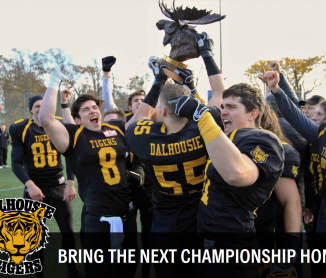 He has coached provincially with Football Nova Scotia for seven years, being award Coach of the Year in 2010. He has experience on both sides of the line, also acting as an offensive coordinator for six years. Dave’s experience as a head coach, leader, and coordinator will be invaluable to the Tigers defence.